On July 12th I will be hosting the opening reception of the most ambitious art show of my career. 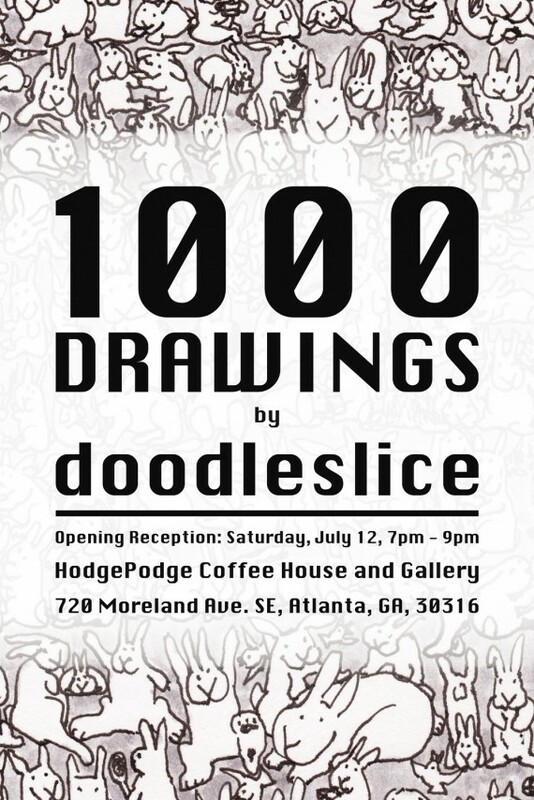 Next week I will be hanging no less than one thousand drawings on the walls of HodgePodge Coffee House and Gallery. What I really want to do here is thank Lynne Tanzer for opening up her gallery walls to this display of inky indulgence. You see, it was really important to me to be able to show 1000 drawings and Lynne was right on board with the idea. 1000 is an important number for me… it was through achieving a self-imposed goal of drawing 1000 doodles by April 15, 2011 that I felt I had reclaimed my artistic soul after over a decade of allowing it to be trampled by my career. More than that, I wanted to present such an abundantly large number of drawings because although we all value love, innocence and happiness in our personal lives, those things are often glossed over and dismissed as naive by both the fine art community and in the media we all consume. By selecting these 1000 drawings from the thousands I have drawn over the past few years I hope that people will perceive the consistent point of view that exists outside of any individual piece – a perspective and a reminder that if we want a world where our best selves can exist and thrive, a world where innocence can survive, then we must hold space for it. These 1000 drawings were created as an act of devotion to holding that space. I hope you will join me on July 12th from 7pm – 9pm at HodgePodge Coffee House and Gallery for the opening reception. Visit HodgePodge Coffeehouse and Gallery online.